All organisms studied contain many RNases of many different classes, showing that RNA degradation is a very ancient and important process. As well as cleaning of cellular RNA that is no longer required, RNases play key roles in the maturation of all RNA molecules, both messenger RNAs that carry genetic material for making proteins, and non-coding RNAs that function in varied cellular processes. In addition, active RNA degradation systems are a first defense against RNA viruses, and provide the underlying machinery for more advanced cellular immune strategies such as RNAi. 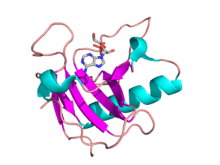 EC 3.1.26.5: RNase P is a type of ribonuclease that is unique in that it is a ribozyme – a ribonucleic acid that acts as a catalyst in the same way as an enzyme. Its function is to cleave off an extra, or precursor, sequence on tRNA molecules. RNase P is one of two known multiple turnover ribozymes in nature (the other being the ribosome). A form of RNase P that is a protein and does not contain RNA has recently been discovered. The active site looks like a rift valley where all the active side residues create the wall and bottom of the valley. the rift is very thin and the small substrate ﬁts perfectly in the middle of the active site, which allows for perfect interaction with the residues. It actually has a little curvature to the site which the substrate also has. Although, usually most of exo- and endoribonucleases are not sequence specific, recently CRISPR/Cas system natively recognizing and cutting DNA was engineered to cleave ssRNA in sequence specific manner. ↑ Noguchi, Shuji (2010). "Isomerization mechanism of aspartate to isoaspartate implied by structures ofUstilago sphaerogenaribonuclease U2 complexed with adenosine 3′-monophosphate". Acta Crystallographica Section D. 66 (7): 843–849. doi:10.1107/S0907444910019621. ISSN 0907-4449. ↑ Michael B. Sporn; Anita B. Roberts (6 December 2012). Peptide Growth Factors and Their Receptors II. Springer Science & Business Media. p. 556. ISBN 978-3-642-74781-6. ↑ V. Raghavan (6 December 2012). Developmental Biology of Flowering Plants. Springer Science & Business Media. p. 237. ISBN 978-1-4612-1234-8. ↑ Rosenberg, Susan M.; Ramage, Holly R.; Connolly, Lynn E.; Cox, Jeffery S. (2009). "Comprehensive Functional Analysis of Mycobacterium tuberculosis Toxin-Antitoxin Systems: Implications for Pathogenesis, Stress Responses, and Evolution". PLoS Genetics. 5 (12): e1000767. doi:10.1371/journal.pgen.1000767. ISSN 1553-7404. ↑ Cuchillo, C. M.; Nogués, M. V.; Raines, R. T. (2011). 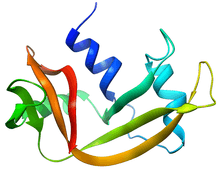 "Bovine pancreatic ribonuclease: Fifty years of the first enzymatic reaction mechanism". Biochemistry. 50: 7835–7841. doi:10.1021/bi201075b. PMC 3172371 . PMID 21838247. ↑ Nowotny, Marcin (2009). "Retroviral integrase superfamily: the structural perspective". EMBO Reports. 10 (2): 144–151. doi:10.1038/embor.2008.256. ISSN 1469-221X. ↑ J. Holzmann; P. Frank; E. Löffler; K. Bennett; C. Gerner; W. Rossmanith (2008). "RNase P without RNA: Identification and functional reconstitution of the human mitochondrial tRNA processing enzyme". Cell. 135 (3): 462–474. doi:10.1016/j.cell.2008.09.013. PMID 18984158. ↑ Tamulaitis, Gintautas; Kazlauskiene, Migle; Manakova, Elena; Venclovas, Česlovas; Nwokeoji, Alison O.; Dickman, Mark J.; Horvath, Philippe; Siksnys, Virginijus (2014). "Programmable RNA Shredding by the Type III-A CRISPR-Cas System of Streptococcus thermophilus". Molecular Cell. 56 (4): 506–517. doi:10.1016/j.molcel.2014.09.027. ISSN 1097-2765. ↑ Rossier, O.; Dao, J.; Cianciotto, N. P. (2009). "A type II secreted RNase of Legionella pneumophila facilitates optimal intracellular infection of Hartmannella vermiformis". Microbiology. 155 (3): 882–890. doi:10.1099/mic.0.023218-0. ↑ Luhtala, N.; Parker, R. (2010). "T2 Family ribonucleases: Ancient enzymes with diverse roles". Trends in Biochemical Sciences. 35 (5): 253–259. doi:10.1016/j.tibs.2010.02.002. ↑ Dyer, K. D.; Rosenberg, H. F. (2006). "The RNase a superfamily: Generation of diversity and innate host defense". Molecular Diversity. 10 (4): 585–597. doi:10.1007/s11030-006-9028-2. ↑ Harder, J. (2002). "RNase 7, a Novel Innate Immune Defense Antimicrobial Protein of Healthy Human Skin". Journal of Biological Chemistry. 277 (48): 46779–46784. doi:10.1074/jbc.M207587200. ↑ Köten, B.; Simanski, M.; Gläser, R.; Podschun, R.; Schröder, J. M.; Harder, J. R. (2009). "RNase 7 Contributes to the Cutaneous Defense against Enterococcus faecium". PLoS ONE. 4 (7): e6424. doi:10.1371/journal.pone.0006424. ↑ Huang, Y. -C.; Lin, Y. -M.; Chang, T. -W.; Wu, S. -J.; Lee, Y. -S.; Chang, M. D. -T.; Chen, C.; Wu, S. -H.; Liao, Y. -D. (2006). "The Flexible and Clustered Lysine Residues of Human Ribonuclease 7 Are Critical for Membrane Permeability and Antimicrobial Activity". Journal of Biological Chemistry. 282 (7): 4626–4633. doi:10.1074/jbc.M607321200. ↑ Rosenberg, H. F. (2008). "RNase a ribonucleases and host defense: An evolving story". Journal of Leukocyte Biology. 83 (5): 1079–87. doi:10.1189/jlb.1107725. PMC 2692241 . PMID 18211964.